A few years ago I bought a little MP3 player. I bought it for a number of reasons, one of them being the ability to drown out annoying sounds, such as screaming toddlers and other people’s asinine phone conversations while using public transportation. I was really happy with the product when I first got it; it was affordable, compact and very user friendly as regards loading and playing my music on the device. Unfortunately, it wasn’t any good for drowning out annoying sounds, as even at full volume I could still hear screaming toddlers and asinine phone conversations over the sound of my music. I was really disappointed, and left a negative review online, which prompted another customer to reply with instructions that enabled me to fix the problem. What I was told was that the European Union has set restrictions on the volume that EU citizens are allowed on their MP3 players and since I had purchased the player within the jurisdiction of the EU, my MP3 player would only play as loudly as the EU permits. What I needed to do in order to get my MP3 player to play as loudly as I chose was to rest it to “Factory Settings” and then when prompted to choose “Region”, choose either North America or Rest of the World from a selection of “North America/Europe/Rest of the World”. I followed the instructions and it worked. My MP3 player now plays loudly enough to drown out all unwanted sounds. Maybe even loud enough to damage my hearing, if I so choose. 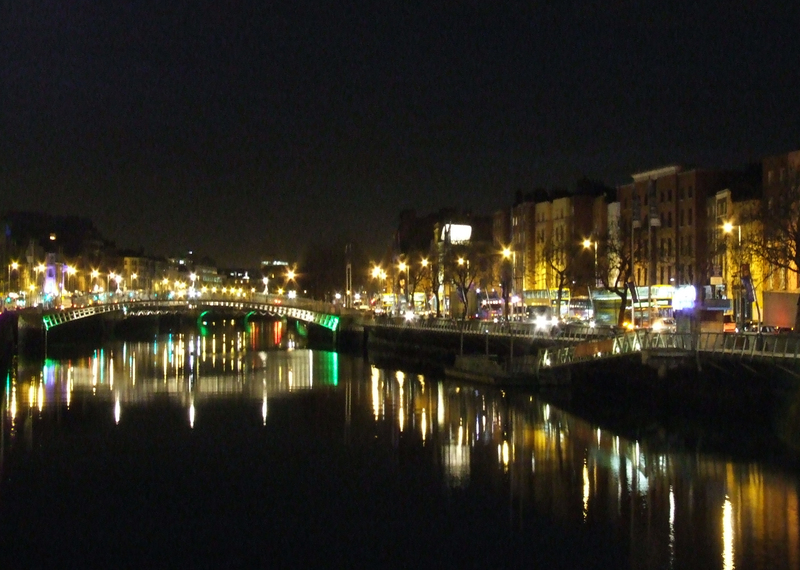 In 2008, we traveled to Dublin, Ireland for a few days. Ireland is a member of the European Union. We booked a disabled room at the Radisson. We’ve had good experiences at Radisson hotels with their disabled access room, and we’ve found that most chains have comparable facilities between the individual establishments. The first thing I always do when we get to our room is to check the bathroom to see if I am going to have any problems taking a shower. The bathroom looked good in our room, except that the door opened toward the door of the room instead of swinging open to the room itself, and there wasn’t enough room for me to get into the bathroom unless I opened the door of our room, went outside into the hall, turned around and then approached the bathroom from the front door. It’s a little difficult to explain, but visualize yourself in your hotel bathroom, facing out. A normal hotel bathroom door will open facing the room, and what you see is your hotel room. In this case, what I saw with the bathroom door open was the door to the room. This meant rolling out into that little space, and then trying to get the door closed in order to get past it into the room. There wasn’t enough space to do that. Their carpenter had hung the door backwards. I immediately went down and calmly explained the problem to the front desk, and a very polite member of staff took me upstairs to see if their other accessible room might be suitable. It wasn’t. The bathroom door was just the same as it was in our room, and in fact, the staff member even showed me several standard rooms and they all had the same problem. I asked the manager if they might be able to get a carpenter out to fix the problem while we were staying there (I used to be a carpenter when I was able-bodied, and I know from experience that hanging a door is only about a half hour job), and she expressed some pessimism that it could be done at all, since it was a “structural issue”. When we checked out, we requested at least a partial refund. Radisson hotels operate with a policy of issuing a 100% refund if you’re unhappy with any elements of your stay and they are unable to fix the problem. I was definitely not happy with the fact that I had to roll out into the hall with nothing but a towel on my lap (I have to get undressed in bed ) every time I took a shower. The manager again stated that the problem was structural and thus beyond their control to correct, and so we left it at that. Guess what. There is no actual definition of “wheelchair/disabled access” according to the European Union. I know this because I chased it on the phone all the way up to EU Headquarters in Brussels, and was told (with sincere apologies) that “No, we are very sorry, but there is no legal definition at this time for disabled access according to EU regulations”. What this means is that the folks that make up regulations for the European Union have managed to decide how loud my MP3 player can be, but they haven’t managed to get around to legally defining Disabled Access. What THAT means, is that there is no legal obligation for a hotel in any country within the Eurpean Union to make any adjustments whatsoever to a room in order for them to be able to advertise it as “accessible”, nor is there any legal recourse for a disabled guest to pursue if the hotel has not made the necessary alterations to a room that they have designated “accessible”. Luckily for us gimps, and with thanks to the hotels that do offer accessible rooms in Europe, “Disabled Access” rooms are usually reasonably accessible, and with only a few exceptions I’ve been able to take a shower in every hotel we’ve been to. A post script: Like I said, I don’t give up easily, and so I thought that if the EU didn’t have a legal definition of Accessible, maybe the Republic of Ireland would have it. I did some digging around, and discovered that while there aren’t any Irish laws pertaining to Disabled Access in particular, Irish Fire Code does require that there be 90 centimeters (about 36 inches) of clearance in the sort of door layout that I described. In other words, with the bathroom door open in our room, I should have had 36 inches of space in order to allow the door to open with me in between it and the front door. I know that there wasn’t anywhere near this amount of clearance, as my chair is only 25 inches wide, from outside of handrail to outside of handrail. So I wrote and sent a snail mail to the manager of the Radisson in Dublin who had refused the refund, and I sent a hard copy to the district manager and even one to the owner of the Radisson chain himself, explaining that as they were, their rooms were in violation of Irish fire code, and that I had not had legal access to the bathroom according to Irish fire code. A week later, we got a full refund. I don’t know if they ever got around to rehanging the doors at the Radisson Blu in Dublin (it’s this one) , so I can’t tell you if you’d have any better luck with the doors than I did. I guess it would be worth a call if you’re planning on a trip to Dublin, because other than the problem with the door, we had a lovely stay there. One more thing. I just did a little checking since starting this post to see if maybe the EU has gotten around to defining “Disabled Access” in the seven years since I spoke with the woman in Brussels, and apparently the answer to that is still “No”. Lots of talk, but according to this newsletter, they were still just talking about it in 2012.